It’s only a few minutes past 1 p.m., and I want my Narnia! Patty gave me the BBC Chronicles of Narnia on disc, the whole series, and rather than just sit here and watch my work-load pile up before my very eyes, I’m going to light out for Narnia. The still, above, is from The Silver Chair. The cast is interesting. The girl playing Jill Pole, Camilla Power, is still a busy actor on British TV, and in spite of all her other work, is still best known for her visit to Narnia–which she doesn’t mind a bit. 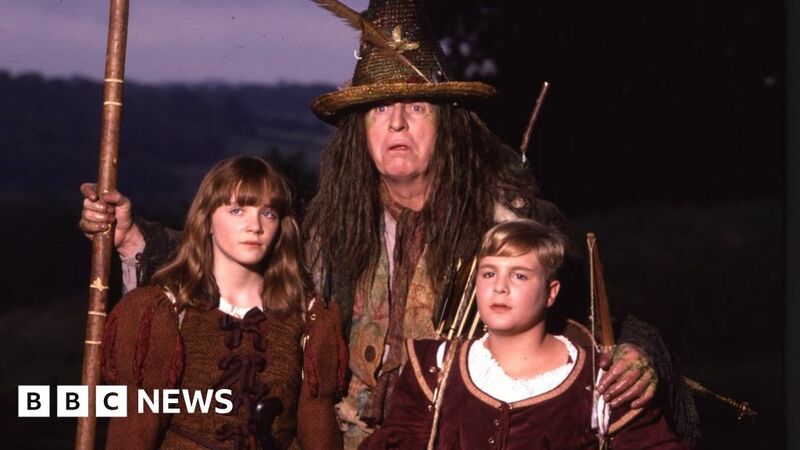 We have Tom Baker (center) as Puddleglum: he’s best known for playing Doctor Who. And the boy playing Eustace, David Thwaite, I believe has gone on to be a lawyer. They don’t seem to have any lawyers in Narnia, so he wouldn’t have a lot of competition. The big splashy new Narnia movies, replete with hi-tech special effects–well, sorry, but there’s just no comparison. They never have gotten around to making their version of The Silver Chair. The kid they had for Eustace, who was perfect in the role in their otherwise not-so-hot Voyage of the Dawn Treader, is now way too old to pass for Eustace. I wanted those movies to succeed, but they tinkered with the stories, plugged in a lot of “improvements” that were not improvements at all, and the whole project seems to be floating belly-up. Oh, well. We still have these, from the 1980s, and they’re still just wonderful. Now that you can get them on easy-to-store discs… what are you waiting for? Note: I’m pretty sure there’s a made-in-Hong Kong version of The Silver Chair. I’d love to see it, but so far it has eluded me. P.S.–I have just discovered a trailer for a new movie of The Silver Chair–which is the first I’ve heard of it. I’m not convinced this movie will eventually be released, and not going to hold my breath waiting for it. I’m sorry, but if that’s Jill and Eustace, I’m the Smith Brothers. This entry was posted on Saturday, December 29th, 2018 at 1:21 pm	and tagged with a personal note, BBC Narnia series, best Narnia movies, fantasy movies, new Narnia movies, the chronicles of narnia, the silver chair and posted in Movie Reviews. You can follow any responses to this entry through the RSS 2.0 feed. I have only seen the movies (all three of them). I watched them a long time ago, so I don’t really remember the details (I liked No. 1 the best). I, too, saw all three–and the TV series is better. I hate how they try to “improve” on the original stories in many productions of classic works. The CBC ruined Anne of Green Gables a while back under the name, Anne, with an E”.